New religious convert Phil Mickelson learned an important rule today: do not tempt the golf gods. 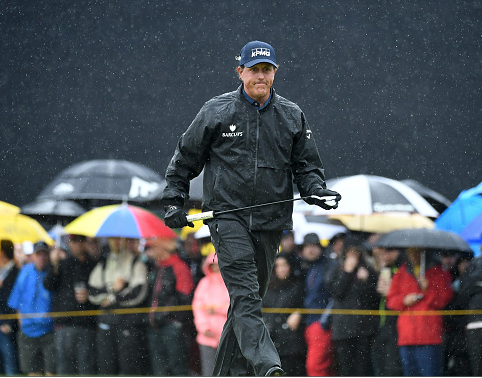 One day after repeatedly, and recklessly, using words like “easy” and “benign” to describe the conditions at Royal Troon that allowed him to shoot a major-tying championship record 63, the vengeful, merciless gods responded with the driving rains and violent bursts of wind that have become synonymous with The Open Championship. While the weather did jostle Mickelson off his torrid pace from round 1, he still put together a solid 18 holes of two-under 69 to maintain his position atop The Open leaderboard. After 36-holes, he leads by one over Sweden’s Henrik Stenson, and three over Denmark’s Soren Kjeldsen and American Keegan Bradley. One of the surprising stories from the first half of this tournament is the method that Mickelson, the 2013 Open Champion at Muirfield, has used to tame Royal Troon. He has set aside his popular gunslinger mentality in favor of a more conservative approach. 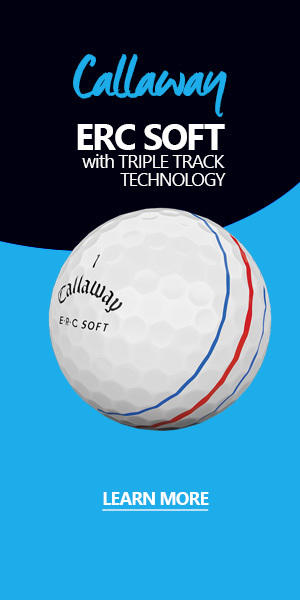 His driving distance has averaged out at 276 yards, nearly 20 full yards short of his PGA Tour average. In turn, he has hit 21 of 28 fairways, and 29/36 greens. He will likely need to maintain that precision if he wants to win his second claret jug, especially as the weather continues to deteriorate. The same goes for Stenson, the 40-year-old and former FedEx Cup Champion, who recently won the European Tours BMW Invitational, who has never won a major championship. He acknowledged after his round that he might not have many more good chances at that elusive major win. However, he was pleased with how things turned out today. While the weather was nothing near what it was yesterday, the early wave, which included Mickelson, did benefit from nicer morning conditions. It was rainy, but the wind did not become ferocious until the afternoon. Kjeldsen, who shot a bogey free round of 68, acknowledged that being in the early wave was helpful. Among the afternoon wave, only world #1 Jason Day (70), was able to grind out a round under par. He shot a -1 70, and is currently at +1 for the tournament, 11 strokes behind Mickelson. Despite being played on the shores of western Scotland, it is the Americans that have feasted off Royal Troon, as five of the top-10 on The Open leaderboard hail from the U.S., with no other country having more than one representative. In addition to Mickelson and Bradley, defending champion Zach Johnson (-5), Tony Finau (-4), and Bill Haas (-4) have set up camp within that top-10. Other notables include Sergio Garcia at -4, U.S. Open Champion Dustin Johnson at -2, Rory McIlroy at -2, Adam Scott at E, and Jordan Spieth at +4. Spieth shot a second round 75, but still managed to make the cut on the number, along with Masters champion Danny Willett. Mickelson and Stenson will comprise the final pairing tomorrow. With the weather turning uglier, Phil’s -10 might be the lowest we see anyone go.